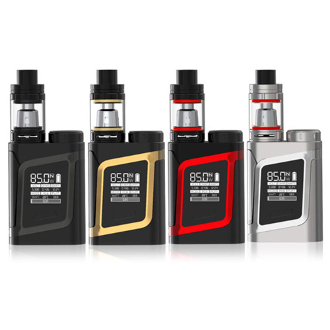 Following the success of their Alien Kit, Smok has produced a smaller model for those who want something a little easier to carry around. Introducing the Alien Baby "Al85" Mod and TFV8 Baby Beast Tank combo. It can fire 85 watts and in TC Mode supports Nickel, Titanium, and Stainless steel 316 wire. It takes one 18650 Battery and can be accessed through a twist of a top battery slot. The battery life will be displayed on the Aliens classic rhombus styled screen, along with your resistance, mode, output, settings etc. The AL85 has a micro usb port is available for charging and vaping and firmware updates.